The internet just looooooves ‘weird beauty hacks’ and one that’s been getting a lot of air time lately is women shaving their faces. Why we’re still thinking of it as a strange trick is beyond me since it’s been coming up off and on in beauty articles since at least the 90’s, but I digress. Being the beauty addict that I am, I’ve tried more than once to jump on that bandwagon and I’ve regretted it. Every. Single. Time. 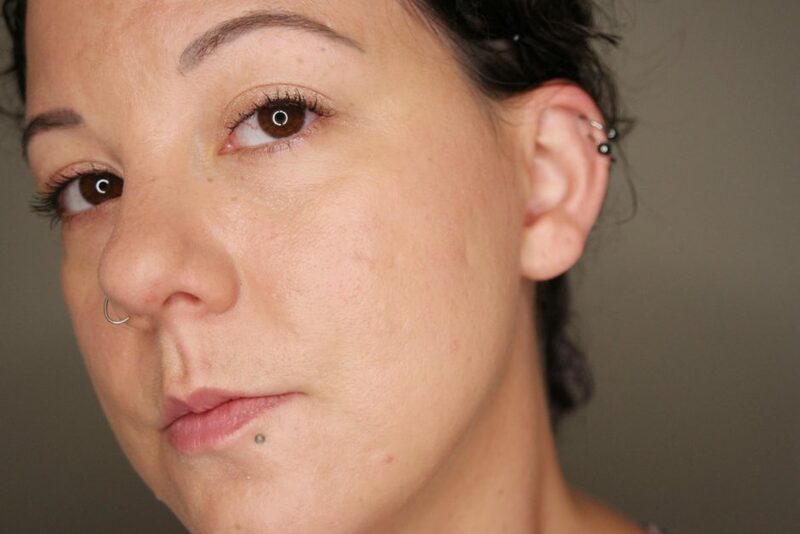 It seems no matter what I do (dry shaving, wet shaving, single blade, multi-blade, thieving my husband’s razors) my skin looks amazing for about 24 hours – then immediately starts breaking out. I suspect it’s some combination of irritation and built-up dead skin. Dermaplaning – where they remove peach fuzz and dead skin with a scalpel – would probably work better, but the going rate for that around here is $65 a session. Not really an expense I can justify a couple times a month. As usual, the consumer skincare industry comes swooping in with the perfect solution – a high-tech beauty gadget called the Dermaflash. 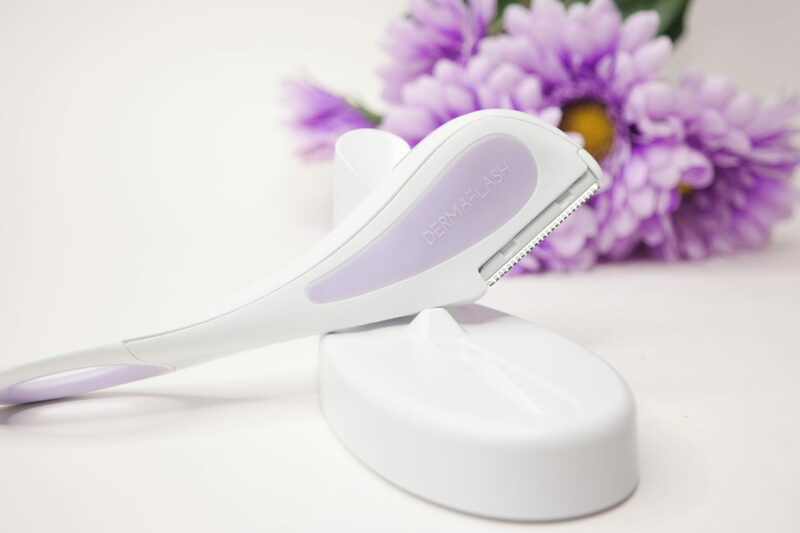 It uses a fine motorized trimmer to remove vellus hair (aka peach fuzz) and built-up dead skin & debris. It’s similar to dermaplaning, except you can do it at home without any special training. The brand sent me the device in the new lilac color (a Nordstrom exclusive, which is 33% off during the Anniversary Sale through 8/6), so I can confirm even a complete noob can do it. The device comes with everything you need to get started. 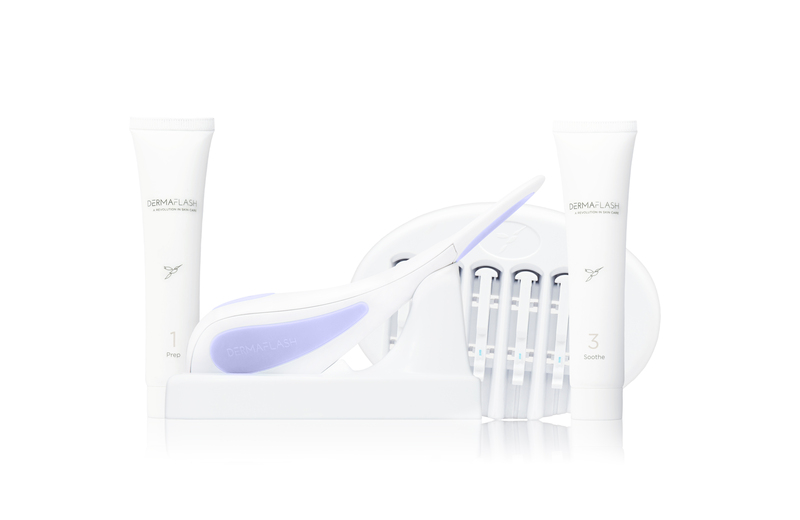 The Dermaflash unit (of course), charging stand, 6 single-use edges and pre/post-use skincare products to help get the most out of it. One word of advice for when you open up the box – they are not kidding about charging it before you do anything else. Each edge is single use for hygiene purposes – it does get pretty clogged up with hair and ick – and it will not charge with an edge installed. Once the edge is removed from the device, there’s a tab that breaks off, preventing it from being used again. So the moral of the story is you want to make sure it’s got a full charge before you install an edge. Of course, there was one looming question in my mind: if shaving wrecks my skin for a week, will this do any better? I’ll admit I went into my first Dermaflash with a tiny bit of trepidation. I patch tested the Prep and Soothe solutions to make sure I didn’t have any weird reactions (all good there) and then used the device the next day. To avoid any possible problems I actually read the instructions and followed them for once in my life – they have a great youtube tutorial here. Holding it at the correct angle took a little practice but once I got the hang of that it was smooth sailing. As promised, my face was fuzz free and baby smooth right away, no irritation. Then I waited. And you know what? I woke up the next few mornings expecting the seemingly-inevitable breakout, but the field of tiny blemishes that always crops up on my cheeks after shaving just never arrived. Instead my skin looked bright and felt smooth. 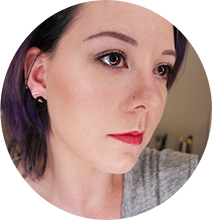 My foundation went on with a perfect finish, even though I purposely went a little crazy buffing it in with a dense brush. My serums and moisturizers seem to be absorbing more quickly, though only time will tell if it makes my skincare products more effective in the long term. Still, after a week went by with no issues, I decided this is, in fact, way better than shaving. No-brainer, right? And when you throw in the Nordstrom sale price, the 10% auto-refill discount on the Dermaflash website, and the fact that you only need to buy the device once, it actually ends up being quite a bit less. The fact that you don’t have to put on pants and leave the house to do it? Priceless.